The Nigerian Maritime Administration and Safety Agency (NIMASA) has expressed its readiness to partner with the British military in the area of human capacity building for the development of the Nigerian maritime sector. Receiving a delegation from the British Military Advisory and Training Team (BMATT) led by Commander Shaun Quinn of the Royal Navy during a courtesy visit to the agency, the Acting Director General, Haruna Jauro said capacity building is vital to the growth and development of the Nigerian maritime sector. The director general said that the relationship between the British and the Nigerian government dates back to the pre-colonial era and that the agency is willing to consolidate on the already existing relationship, especially in the area of training for the growth and development of the Nigerian maritime sector and the nation at large. “The agency is willing and ready to collaborate with the British Military in the area of training of our personnel because training is part of capacity building and capacity building is key to the growth and development of the maritime sector,” Jauro said. 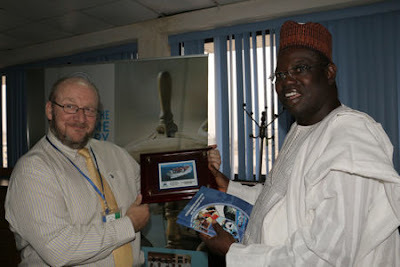 Earlier, the leader of the delegation who is also the BMATT Staff Officer Maritime, Commander Shaun Quinn noted that the reason for the visit was to know some of the functions of NIMASA and to also discuss possible areas of collaboration with the agency as regards the training of its personnel towards enhancing a virile and safer maritime sector. Commander Quinn said that the British High Commission was busy refreshing relationships with the country since a new administration took over and that the British Military will always be ready to build a closer working relationship with the Nigerian government where the interest of both countries is put into consideration to enhance trade facilitation and security on the nation’s waterways.